KnitPicks Swish Superwash [100% superwash wool; 110yd/100m per 50g skein]; color: shown in Bok Choy and Deep Ocean; less than one skein. 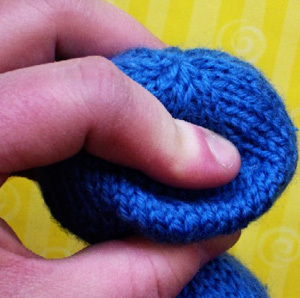 Note: Yarn is knit more tightly than recommended ball band gauge to ensure a firm fabric, which will give toy additional structure and prevent stuffing from seeping out. Note: When working with a small number of sts, you may find it easier to divide them between 2 needles, instead of 3. Using desired color, CO 8 sts. 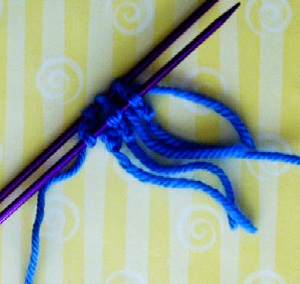 Divide sts between needles and join to work in the round, being careful not to twist. Round 3: [K2, m1] to end. 24 sts. Round 5: [K3, m1] to end. 32 sts. Round 6-7: K all sts. Round 8: [K4, m1] to end. 40 sts. Rounds 9-10: K all sts. Round 11: [K5, m1] to end. 48 sts. Rounds 12-15: K all sts. Round 16: [K4, k2tog] to end. 40 sts. Rounds 17-18: K all sts. Round 19: [K3, k2tog] to end. 32 sts. Rounds 20-21: K all sts. Round 22: [K2, k2tog] to end. 24 sts. Rounds 23-24: K all sts. Round 25: [K1, k2tog] to end. 16 sts. Next Round: [K2tog] to end. 8 sts. Continuing from neck, work Rounds 1-25 as for Body. Stuff neck firmly, and head lightly. If using plastic safety eyes, apply now. draw through all sts and pull tight. Weave in ends. CO 2 sts. Work 4 rows I-Cord. Work 2 more pieces in the same way, but do not break yarn at end of last piece. Using photo --> as guide, slip one st from each cord to one needle, and other st from each cord to a second needle. Be sure that st with working yarn attached is at end of one needle. Work 6 rounds over these 6 sts. BO all sts, leaving a tail approx. 12 inches long. Weave in short yarn ends. 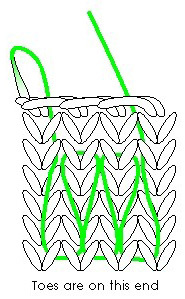 Using long tail, sew leg as shown in illustration below. Pull the stitches firmly, but try to match the tension of the knitted fabric of the leg. This will shorten the front of the leg, bending the work so that the foot sits at an angle to the leg, forming a heel at the back. 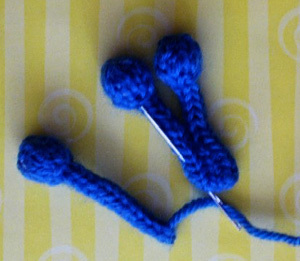 Draw the yarn tail back up through the center of the leg. Work as for foot of leg. Work 14 rounds over 6 sts of hand. BO all sts. Weave in short yarn ends. 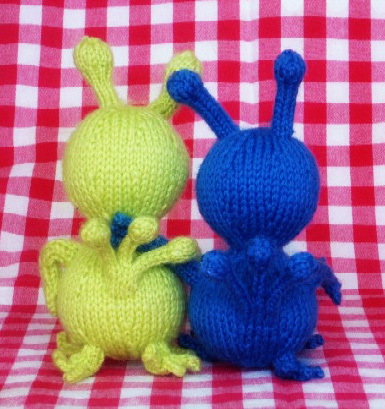 If poseable arms are desired, insert lengths of chenille stem into arm. CO 6 sts, leaving a 12-inch tail. Work 12 rows I-Cord. Round 1: [K1, m1] 6 times. 12 sts. Round 4: [K2tog] to end. 6 sts. Stuff bobble lightly. Break yarn, leaving a tail 6-8 inches long. Thread tail thorugh yarn needle, draw through all sts and pull tight. Weave in end, but do not weave in long tail at CO end. CO 3 sts, leaving a 12-inch tail. Work 12 rows I-Cord. Round 1: [K1, m1] 3 times. 6 sts. Round 2: Work 1 row I-Cord. Divide sts between needles. Round 3: K1, m1, [k2, m1] twice, k1. 9 sts. Round 5: [K2tog, k1] to end. 6 sts. photo, along lower 0.5 inch of length. Form the mouth, using photos to guide you. Pinch front of head as shown. color for clarity only. 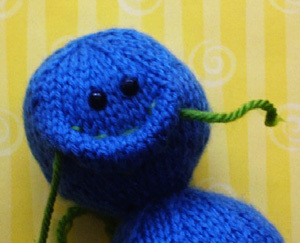 Zozo will look best if you baste and sew using the working yarn. Sew mouth in place, pulling stitches firmly. 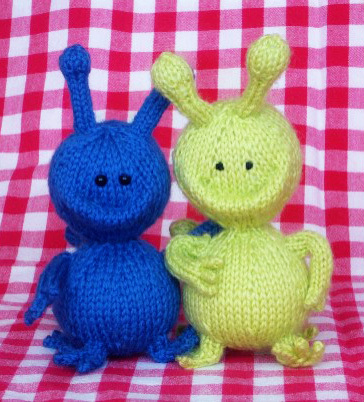 Sew antennae, arms and legs to body as shown in photos. Legs should be evenly spaced around body, with toes pointing outward. 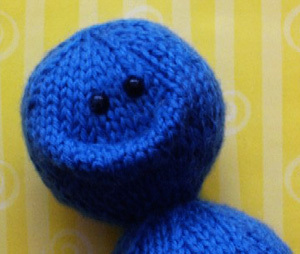 If you have not used safety eyes, embroider eyes on face.